Will a bot take your job? An estimated 45 per cent of existing jobs in six Middle East countries, accounting for $366.6 billion in wage income, could be automated, according to McKinsey & Company's latest report. "In all six Middle Eastern countries examined, 20.8 million full-time equivalent employees (FTEs) are associated with activities that are already technically automatable today," the report, The Future of Jobs in the Middle East, said. In the UAE, the research estimates that based on the segmentation of work activities by sector, occupation and education, more than 93 per cent of the labour-saving technical automation potential applies to jobs currently held by expat workers. More than 60 per cent of the automation potential is concentrated in six out of the 19 sectors examined; these include other services, administrative and support, government, manufacturing, construction, and retail trade as well as wholesale trade. The potential for automation translates into massive economic value and opportunities across the region, said the report launched recently at the World Government Summit. "Our research encourages Middle East policymakers and business leaders to embrace the transition into the new age of automation, and invest in skills that workers of the future will require," said Jan Peter Moore, associate partner at McKinsey & Company. "For countries such as the UAE, Bahrain and Kuwait, the projected proportion of work, and by extension workers, displaced is higher than the projected global average. This means workers in these countries will need to evolve to adapt to global forces of workforce automation and technological progress more rapidly than other countries in the region," said Moore. "As the future of work materialises, policymakers have a window of opportunity to embrace artificial intelligence (AI) and automation, equip workers with the rights skills that complement new automation technology, increase opportunities for new jobs from the implementation of technologies, take advantage of technological disruption to build new competitive advantage, and reinvest AI-driven productivity gains in strategic diversification initiatives across sectors," said the report. According to a research report by PwC Middle East AI is poised to contribute $320 billion to the economy of the Middle East, equivalent to 11 per cent of the regional GDP by 2030. The most significant relative gains in the region are expected in the UAE where AI is expected to contribute almost 14 per cent of GDP in 2030, which is equivalent to $96 billion as the global economy stands to claim a contribution of $15.7 trillion, the PwC research said. "The UAE is followed by Saudi Arabia (12.4 per cent), the 'GCC4' (Bahrain, Kuwait, Oman and Qatar (8.2 per cent)) and then Egypt (7.7 per cent)," the survey by PwC Middle East said. The annual growth in AI contribution will be 33.5 per cent in the UAE during 2018-30, Saudi Arabia 31.3 per cent, the GCC4 28.8 per cent, and Egypt 25.5 per cent. Richard Boxshall, senior economist at PwC Middle East, said in the wake of the fourth industrial revolution, the impact on productivity alone would be transformational and disruptive for a region like the Middle East which faces weak productivity levels. "Investment in AI technologies could strategically position the region for the years to come and help it move away from its reliance on oil." 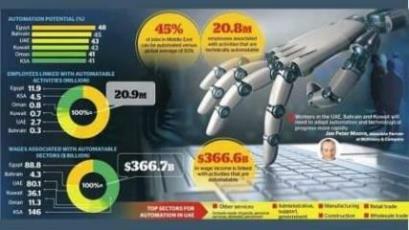 The report by McKinsey & Company said automation's potential varies substantially across industries. Sectors like manufacturing, transportation and warehousing where routine tasks are common have a high potential for automation, whereas sectors where more human interaction is required, including the arts, entertainment, recreation, healthcare and education, have a lower potential to be automated - ranging from 29 to 37 per cent. "For policymakers and governments in the region, there is a critical link between displacement by automation and low-to-medium levels of education and experience. In a region where 57 per cent of the current employed workforce has not completed a high school education, automation poses a real risk. The automation potential more than halves, falling to nearly 22 per cent, for employees holding bachelor or graduate degrees," said the report.